Mountain Colors Hand Painted Yarns: We celebrate our 20th Year in business!! We celebrate our 20th Year in business!! We recently had our 20th anniversary!! Or is it our 20th birthday?? Anyway we thought it would be fun to share WHO we are at Mountain Colors. So in the upcoming months we will be sharing a little bit about each of our employees. To start things off this month we are featuring Diana McKay and Leslie Taylor, the owners of Mountain Colors! Here is the yarn we dyed for our first commission. It was woven into sashes for the Charles M. Russell Museum in Great Falls, MT. Leslie was born in Georgia and has lived in 6 other states. She spent most of her growing up years in northern Maryland and her college years in southern Maryland at St. Mary’s College of Maryland, majoring in Biology with a minor in Chemistry. Her parents and grandparents are from Gettysburg, PA . Her great-grandfather was 12 years old during the big Civil War battle in Gettysburg. Leslie taught herself to knit from a book while in junior high and she still has the book she used! After college Leslie moved to California to work and met her future husband, Brett, while banding ducks at a northern California wildlife refuge. The first 3 summers after they were married they worked for the National Park Service as back country rangers in Dinosaur National Monument. They worked with people who were on white water rafting trips along the Green River in Utah and Colorado. Leslie and her husband have 2 sons and moved to western Montana when the boys were 3 and 5 years old. Brett teaches high school science. It was during the time that the boys were very young that Leslie and Diana founded Mountain Colors. 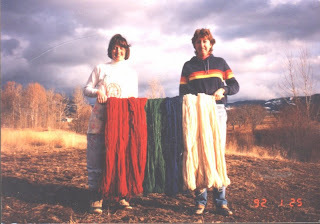 Twenty years later Mountain Colors is still dyeing yarn and the boys are grown. The years have flown by!! Leslie and Brett like to hike, go camping and fishing, watch sporting events and travel. Leslie is a member of the local Fiber Guild and also a Weaving Guild. She never goes anywhere without her knitting and a book. Leslie’s favorite Mountain Colors colorways are Red Willow and Headwaters. Diana was born and grew up in Great Falls, MT. She had yarn in her hands for as long as she can remember. Her Grandmother taught her to knit and weave at an early age and she was encouraged to pursue art classes through school by parents who had a great love for color and design. Diana went to college at Montana State University and majored in Business Marketing. She met Jim there, married and had two little boys. It was during Lamaze class while expecting her younger son that she met Leslie Taylor. She and Leslie discovered they both had 2 ½ year old sons at home born less than a week apart and would soon have similarly spaced babies. They also discovered they shared an interest in knitting, weaving and spinning. It was a happy time of babies, play groups and yarn. When the kids started school Diana and Leslie decided to give hand dyeing yarn a try as a part time job. Mountain Colors was born in Diana’s kitchen and 20 years later the two have more than part time work . They also have a deep gratitude for this amazing experience and the opportunity to work with the best dye and office crew anywhere, great sales reps, wonderful designers and to meet people from shops and other yarn companies from around the world. Somehow during the last 20 years the boys have grown up to be awesome young men. Diana and Leslie’s oldest are now both out of school and married and the youngest are in graduate school. All four boys worked at Mountain Colors at one time and still have an understanding of yarn if not a great love of it like their moms. Diana and Jim enjoy hiking, fishing, cross country skiing and opportunities to enjoy the outdoors. She remains passionate about knitting, weaving, and spinning and will continue always to search for the most pleasing combination of form and design as one color flows into another. Diana’s favorite Mountain Colors colorways are a tie between Ruby River and Larkspur. Congratulations!! Nice write ups, will keep watching just in case you post about Jim! Thanks for the interesting post! Please tell us more about the source of your wool.